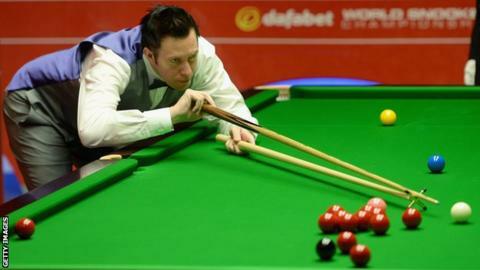 Wales' Dominic Dale is confident he can win his quarter-final clash against world number four Barry Hawkins in the World Championship. World number 24, Dale reached the last eight for the first time since 2000, beating Michael Wasley 13-4. The 42-year-old led 12-4 going into the final session and won the one frame he needed to book a meeting with Hawkins, which will begin on Tuesday. "I can't see any reason why I can't beat Barry Hawkins," said Dale. "He'll probably be saying the same thing. He's world number four and he's proved himself a better player than I." Dale who beat Mark Davis 10-5 in the first round had to negotiate two qualifying rounds to make it to the Crucible. Nicknamed "Spaceman" Dale says he is happy with his form going into his quarter-final with Hawkins. "I'm happy with the way I'm hitting the ball," said Dale. "My technique and everything's coming together. I don't feel too fatigued having won my first two matches. They've been spaced out well and I've won them quite comfortably." Dale is the only Welshman left in the tournament following Ryan Day's 13-7 defeat to Judd Trump. Despite his self-belief and form, Dale is expecting a tough match against Hawkins. "He does everything well," said Dale. "We play similar games. On the day it's just going to be who does it better, who deals with the difficult situations better. "I'm really looking forward to playing Barry. "I'm hoping it will be a close match and may the best man win."